How was your Thanksgiving? My home was filled with family and friends, kids running around, and way too much food. It was by far one of the best Turkey Days yet. On our Facebook page this past week, some of our team shared what they are thankful for in 2016. Hope you had a chance to read their thoughts and share yours. Tomorrow kicks off our month-long Surviving the Holidays series. Women will be sharing how they made it through the holidays in the midst of their trenches. For me, the holidays are always a mix of emotions. Eli passed away before this time of year, so I have no memories of a complete family and my heart aches for what could have/should have been. I wonder if he would like Santa or run from him like my girls do? What would a boy in a world of pink ask for as presents? Even the decorations on the Christmas tree would be less "Disney princess" and more . . . what would a little boy like on a Christmas tree? We have found ways to incorporate him in our lives for December. Eli has a stocking in the middle of ours. He has special ornaments on our tree. But like those in the midst of their trenches, I wonder what else we could do during this time of year for him, because of him, to remember him. How do we carry this great heartache and still create wonderful memories for our girls? I hope our series offers you hope and encouragement for the next month. 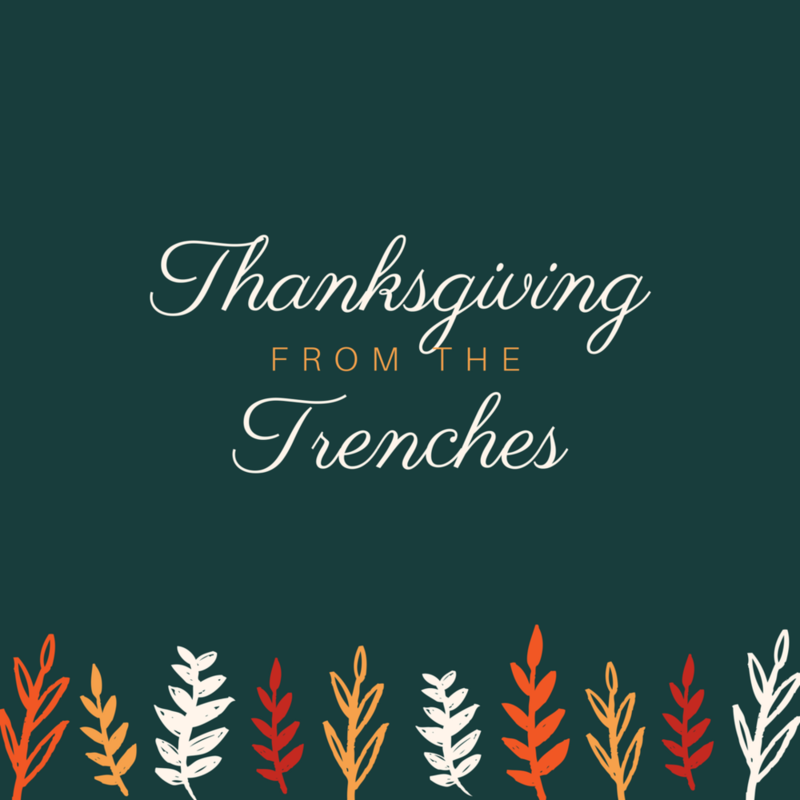 May you find some joy and peace even in the midst your trench. I'm trying to get in the holiday spirit. My Christmas tree is up, the banisters are decorated, and Star Wars inflatables have been placed in the yard. I shopped 'til I dropped on Black Friday, and our budget wasn't blown. But my heart is lagging behind in Christmas spirit. Maybe it is the lack of snow—or the feeling of "Where did this year go?!" I'm pretty sure it really is the always-nagging sensation, that even with just having the best Thanksgiving ever, my family is incomplete. I am incomplete, and another holiday season with traditions, cookies, and gifts will never be what I imagined my years to look like. I'm looking forward to our holiday story series, so I too can learn and gain some wisdom from those a little farther along this road. Maybe then my heart will catch up to one of the best times of year.